The first surprise of “the Trial” is the score. It is unmistakable Philip Glass. On a couple of occasions a run of notes echoes the “Mishima” soundtrack of thirty years back. But the drive of repetitions and rhythms that characterised the composer’s film work has been replaced with a music of vastly augmented colour and texture. This seductive texture is exemplified in the composer’s use of a harmony of piccolo and marimba. Under conductor Michael Rafferty the twelve musicians and eight singers meld seamlessly. Every word in Christopher Hampton’s libretto is to be heard. The primary impression of Michael McCarthy’s direction is that a ferocious and precise intelligence is at work. Franz Kafka is one of the four writers from the last century whose name has engendered an adjective. The Kafkaesque world has morphed in a way that is less lethal than the last fate dealt out to Josef K but is none the less devastating. See the teacher from Barmouth who this season suffered a minor theft of a phone while in Spain. The delivery of a fifteen thousand pound bill from a telecoms behemoth is one blow. But the fact that it is unpayable means that he is, courtesy of the great credit databases, to be denied all loans and thus any hope of future home ownership. 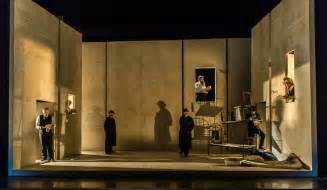 It is all too easy for a director looking for shallow effect to re-clothe Kafka in modern dress and clutter the stage with cameras and digital paraphernalia. Instead director and designer Simon Banham create a production with a look that is not strictly historical but emblematic of the galvanic shifts behind Kafka’s life. The older members of authority come with garters and braces, fob chains and frock-length coats. The thick beards are reminder that, in Stefan Zweig’s telling of the last days of the Austro-Hungarian polity, age was venerated and young men would grow beards to emulate years far beyond their actual age. Philip Glass’ attraction to “the Trial” was his seeing in Kafka a natural dramatist. It is a dialectic of individual versus state. K, a banking manager of high status, wears in contrast a close-cut, tightly buttoned jacket with high lapels. When he loses it- his physical stripping following his metaphysical stripping- a trio of giggling faces watch and sing to the fact. The mode of life in Prague and the great other cities of Europe is distinctive from Britain in one respect. The fact of living in flats and blocks creates a more enclosed neighbourness. In work in other media- the film “the Lives of Others” or Hans Fallada’s “Alone in Berlin”- the role of aware neighbours is critical. McCarthy and Banham create this world figuratively. K’s home comprises fifteen-foot high undecorated walls. Their blistered surface is reminder that the time of Kafka’s writing was one of extreme duress-in 1915 the invading Tsarist army in Galicia was only three hundred miles away. Fittingly the pictures in this envisaged world- courtesy of Judie Christie- are portraits of senior guardians of the law. The omnipresence of observers is achieved by the set enclosing hidden doors and windows. Kafka’s plot is followed by Glass and Hampton in close detail and fields a host of characters, high and low, from a culture where social structuring underpinned all interaction. The two inspectors who first interrupt K’s morning are revealed to have pay so low that the pilfering of underwear is perforce a norm of the job. Kafka’s life over an age of total change is indicated in his furniture. Bed and chairs of metal are of a pencil-thin modernity, a nod to the revolutionary work of the young Marcel Breuer just a handful of years away. “The Trial” might sound sombre but its tone is far removed from, for example, Orson Welles’ film treatment. The range of characters is filled with detail- although it must be admitted that the roles for women hardly stand alongside the great heroines in the opera canon. There is not much to them beyond sexual allure. The text hums with paradox. Being under arrest, assure the inspectors, need not interfere with daily life. The makers craft in allusion to Magritte and Hergĕ’s Thomson and Thompson. Artists of depth know that seriousness is not earnestness. “The Trial” is the result of co-commissions from three other nations. Scottish Opera is involved. The production arrives in Aberystwyth after Covent Garden’s Linbury and is set for Theater Magdeburg in 2015. It is a major work.